Lizard body bends and flexes with a realistic slithering motion! Decorate with paint or markers! Lizard body bends and flexes with a realistic slithering motion! Decorate with paint or markers, sold separately. 12" long. 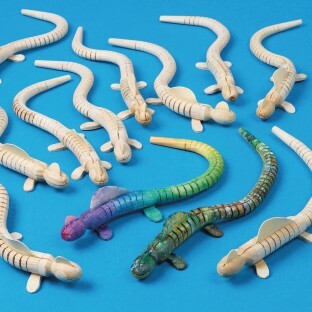 These are perfect for Junior Naturalist Camp! The kids find samples in the Field Guides and duplicate the markings....or create their own species! Children of various ages can paint and use this product while creating a fun loving pet of their own.